Service: Nurse, Sherburn Barracks Hospital, in Washington, D. C., 2/14/65-12/65. Marker/Plot: 42.791577,-73.687824 - "U.S. Army Nurse"
In September (2014) Deanna French of Morrisville contacted me for assistance in obtaining information on Jane Steady of Waterbury whom she found to have served in the Civil War. As I had not heard of Jane, I started a search to see what more I could discover about this woman. Deanna had furnished the names of her husbands and, also, where Sarah Jane had died. My search was to start at the beginning and try to find out what I could about her, her husbands and any family that she might have. My first find for the family was the 1850 census for Hinesburg where 18 year old Augustus Steady was living with his parents, Lewis and Charlotte Steady and his younger brother and sister, plus his grandmother Mary Steady. In 1860 Sarah and Augustus were living in Johnson, Vermont. The information stated that the 24 year old Sarah had been born in Vermont. Augustus was listed as a farm laborer. Although the marriage has not be located, this census showed that they were probably married on or before June 1, 1860. At 28 years old Augustus enlisted as a Private in the 3rd Regiment, Company E of the Vermont Volunteers and was mustered in July 16, 1861. He was discharged August 30, 1862. On February 6, 1864 Augustus enlisted as a soldier in the regular Army at Mitchell Station, Virginia where he joined the 5th Calvary, Company A. He was described as 30 years old, born in Hinesburg, Vermont; occupation soldier; black hair; black eyes; dark complexion and 6'1". Where were they between 1862 and 1864? Were they staying in DC where Sarah had been working as a nurse or did they move back to Vermont? What was Augustus doing in Virginia that he would enlist in the regular army in that state? Maybe the pension papers for both of them might answer those questions and other questions. Augustus was discharged at the expiration of his service on February 12, 1867 at Camp Sweet, Raleigh, North Carolina as a private. In 1870 Augusta and Sarah were living in Cady's Falls, which had it listed as in Stowe. They had a 5 year old daughter named Jennie A., who was born in Washington, DC. This census had Sarah as born in New York. Augustus was a farmer with who did not own any land at that time, but did have personal real estate valued at $200. Living with the family was Mary McIntrie of Canada who is listed as "Boarding" but no relationship other than that was given. Their son Fred E. Steady was born February 21, 1874 in Waterbury. This gave the first clue to Sarah's maiden name which was Backum and it once again gives her birth town as Johnson. At the time of Fred's birth, Augustus was farming. Their second daughter Mary A. was born in Waterbury on May 19, 1876. Augustus died in Waterbury on June 27, 1876 at the age of 44 of apoplexy. He was buried at the Old Waterbury Center Cemetery on Route 100. 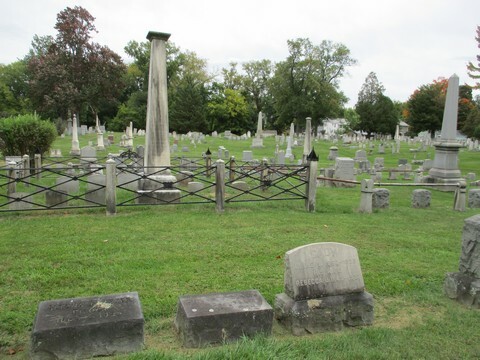 Fred lived to the age of 5 when he died January 5, 1879 and was buried near his father. 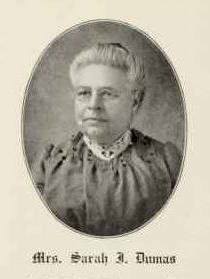 Sarah remarried in Waterbury on October 13, 1877 at age 41. She was listed as the daughter of Francis and Mary (Martin) Backum. Her new husband was a 50 year old shoemaker named Edmund Dumas. Dumas, who was born in LaPrairie, Canada, was the son of Morris and Mary C. Dumas. Edmund and his late wife and Sarah and Augustus had all lived in Cady's Falls in 1870. The assumption could be made that the families knew each other. In 1880 Edmund, Sarah, Jennie and Mary were living in "the village of Waterbury Center" according to the census. They apparently moved away from Waterbury for a time because the 1890 census shows that Sarah J. Dumas, widow of Augustus Steady, lived in Cohoes, Albany, New York. 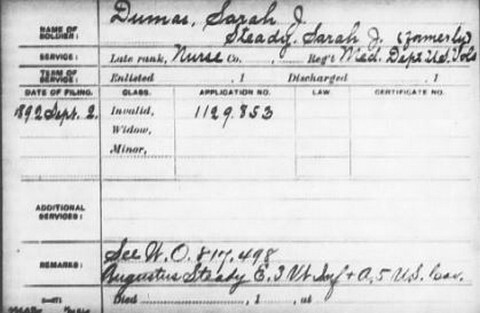 On September 2, 1892 Sarah Steady Dumas of New York filed a Civil War pension Application # 1129853 to apply for her Invalid Benefits as a nurse, Medical Department U.S. Volunteers. The 1900 census shows that Edmund and Sarah rented a house in Waterbury Village. Birth dates given were that Edmund was born July 1826 and Sarah in December 1836. She had been the mother of three children, but in 1900 she had only one daughter still alive. On November 26, 1902 Edmund died of Bright's disease at their Mill Village home in Waterbury. In the state of New York on November 29, 1904, Sarah applied for her widow's benefits from Augustus' time in the 3rd Vermont Volunteers and the 5th U.S. Calvary on Application #817498. Sarah apparently moved to New York to be near her oldest daughter, Jennie, who went by her middle name of Atona. Atona was married to Thomas Barter and they had a child, George, who died in 1917. Atona later married to George W. Fisher. After moving there, city directories show that Sarah worked at her former profession as a nurse for several years. 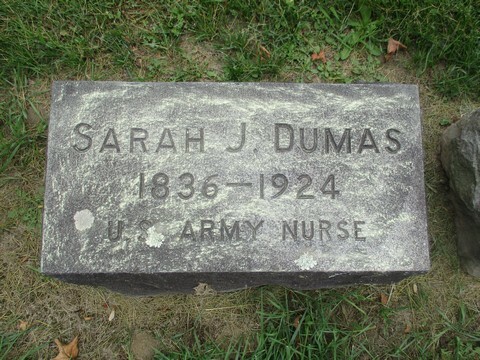 The Schenectady Gazette on November 29, 1922 had the following note: "Mrs. Sarah Dumas of 114 Edward Street a civil war nurse, who has been confined to her bed some time as a result of serious injuries, is better." In 1924 Sarah was still living at her residence at 124 Edward Street in Schenectady. 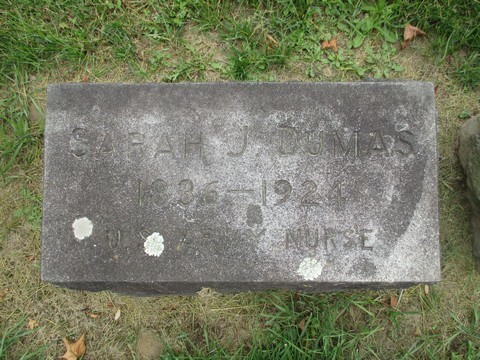 According to her gravestone in Waterford Rural Cemetery, Waterford, Saratoga, New York, Sarah died in 1924. Her inscription reads "US Army Nurse." Additional documents from Sarah's pension applications, including affidavits from a life-time friend, Rodney V. Corse, a Lamoille County soldier, and her brother John, also a veteran. In reply to yours of the 12th Inst., would say, my duties as "Matron" consisted of washing and ironing all bed clothing and clothing of patients. In the hospital, "Diet" cooking etc. and nursing patients, as nurse I was expected and did attend to patients washing hands faces and combing hair, administer Medicine as per directions of Doctors and all other duties appertaining to the vocation of a nurse. I left Sherburne Barracks Hospital on the 30th Day of June 1864 to take a Situation at the "Government Insane Asylum" but returned on the same day to Sherburne Barracks Hospital and assumed my former duties of Nurse in said hospital until late in November of 1864. I have no documents of any kind showing my connection with the Hospital. Have no recollection of any persons connected with the Hospital at the time I was employed except the Asst. Surgeon in charge, Viz. Dr. Wiseall and Dr. Cunningham and the Hospital Steward James B. Totten, whose present address is unknown to me. I think that Dr. Wiseall, Dr. Cunningham or Hospital Steward James B. Totten could certify (if living) to the fact and length of my service at "Sherburne Barracks Hospital." Also Major James W. H. Stickney, late of Camden N. J. That he was a member of Co. "B" 4th Regiment Vt. Vols. during War of Rebellion. Knew the claimant always since childhood. Went to school together and in the first week of October 1864 his wife wrote and told him that Miss Steady was in a Hospital as Nurse, and if he was in Washington at any time to hunt her up. And a week or so after the battle of Cedar Creek, he got a furlough, called in Washington D.C. and found claimant on Capital Hill in Sherborn Barracks Hospital doing duty as Nurse, and know she was there to the best of my knowledge and from letters received from home that she remained there until last part of November/64. He further states that we was not prompted by any pension or printed matter or influenced in any way whatever but from his own personal knowledge of the day herein stated, and dictates it to Thomas F. Farrell Notary Public in his office at Waterbury, Oct. 28 1895. His Post-office address is Bethel, Windsor Co. Vermont and he further declare that he has no interest in said case and is not concerned in its prosecution. Personally appeared before me a Notary Public duly qualified to administer oaths John C. Backum a person well known by me as a man of credit and worthy of belief and after being duly sworn by me according to law deposes and says that he is 57 years of age and was in the war of the rebellion and am a pensioner under Pension Certificate No. 14109 and that I visited the Hospital in Sept. 1864 at Washington D.C. and at that time went to visit my sister Sarah Jane Steady who was serving as Matron and Nurse in the Sherburn Barracks Post Hospital. I further say that I also visited her at said Hospital as many as 4 or 5 times during the summer and early fall of 1864 and know she was so employed during that season. I will further say that I have on interest in the prosecution of her claim for a Nurses Pension, and further that she is getting old and infirm and is entitled to the Pension asked for, as she is unable to gain a living by manual labor. The Schenectady, NY Gazette, June 24, 1925, in an article about the city's Daughters of Veterans organization, "Mrs. Altoona Fisher presented a large Bible in memory of her mother, after whom the newly organized tent was named (apparently how chapters of the Daughters of Veterans were designated) after whom the newly organized tent was named, and who was an army nurse in the Civil War."